The starting point of every carpet is the fiber. Look at a carpet and you’ll see fibers created from thousands of tiny threads that when combined create color and patterns and style. They define both the texture and the softness, and will determine how durable your carpets will be in the months and years to come. Most carpets are constructed with either bulked continuous filament (BCF), which are long continuous strands twisted together to form carpet yarn, or Staple fibers, which are bulkier and shorter fibers like wool. There are only four primary fibers used in carpeting today: nylon, polypropylene, polyester and wool. Nylon – is a petroleum based synthetic fabric that was invented by Dupont Chemical Company as a silk alternative. Today’s nylon is engineered to be durable, wear resistant and offer resistance to stains, making it a perfect choice for high traffic areas. Polypropylene – is a colorfast, stain resistant, moisture resistant, and low static option for carpet. It’s lightweight, won’t fade, and stands up well to strong chemical cleaning products. It’s a softer fiber, not as durable as wool or nylon, and should be used in lighter foot traffic areas, such as bedrooms. Polyester – is a less expensive alternative to wool. It still offers the environmentally friendly factors of wool, often being made from recycled products such as plastic soda or water bottles. It’s colorfast, soft, plush and one of the most affordable carpets you can buy. Wool – is created from sheep fiber and is often considered to be the very best carpet material available. It’s natural, durable, luxurious, soft, flame retardant, water repellant, stain resistant and environmentally friendly. Visit a flooring dealer and you will find carpets by many different manufacturers. Think of it as you would fashion; the name brand gives an indication of the quality and the workmanship. Carpet works the same way, with name brands offering you the best quality in the business. Brand names are manufactured to strict standards, offering better performance characteristics, improved stain and static resistance, and better warranties. 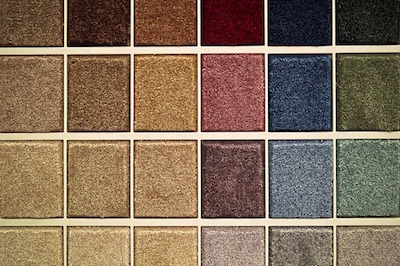 Want to find the perfect carpet for your home? Stop by today and discover the perfect carpeting for your home.